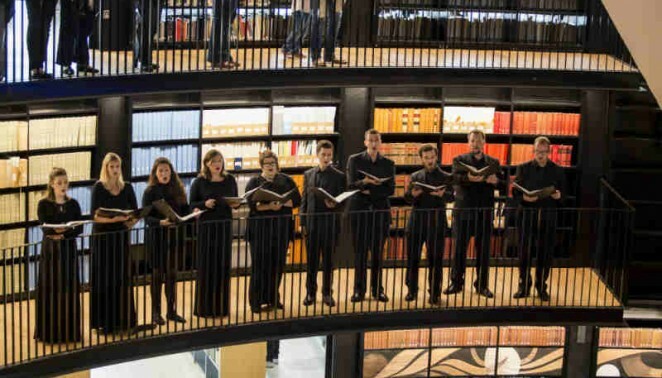 Comprising eight to twelve professional singers – who feature regularly as soloists with Ex Cathedra – the Consort is both one of the UK’s premiere vocal consorts and the culmination of Ex Cathedra’s commitment to choral training. It provides opportunities at the highest level for the UK’s best and emerging consort singers. Many Consort singers have, and continue to, come through Ex Cathedra’s academy system and many have gone on to pursue successful solo careers. The Consort has performed at festivals across the UK and abroad; appearances include the Aldeburgh, Aranjuez, Chelsea, Lufthansa, Santiago de Compostela, Sagra Musicale Umbra and St David’s festivals, plus concert series from Malvern and Warwick to New York. It appears regularly at Dartington International Summer School, both giving concerts during the week and acting as tutors on the Vocal Chamber Music course. The Consort has recorded Gabrieli Sacred Symphonies, Lassus St Matthew Passion, Fire Burning in Snow and Peerson: Latin Motets as well as featuring prominently on a number of other discs.